If you want to deploy applications on Beta 2 for live internal usage or by third parties, you need to accept the Go-Live license. As everyone is blogging about the obvious, I will stick to the more interesting bits (in my opinion, of course). For example, the updated Visual Studio 2005 Team Foundation Server Installation Guide. From the "shameless self-promotion departement": we just pushed 1.1PR out the door. You can read the detailed announcement here. It has a bunch of cool new features, now we enter the stablization and polishing phase. Shouldn't take too long to follow it up with a Beta. Just seen on NTBugtraq, quote from the Web site: SQLRecon performs both active and passive scans of your network in order to identify all of the SQL Server/MSDE installations in your enterprise. Due to the proliferation of personal firewalls, inconsistent network library configurations, and multiple-instance support, SQL Server installations are becoming increasingly difficult to discover, assess, and maintain. SQLRecon is designed to remedy this problem by combining all known means of SQL Server/MSDE discovery into a single tool which can be used to ferret-out servers you never knew existed on your network so you can properly secure them. Didn't yet have time to try SQLRecon myself, but sure will. From the Windows Media home page, you can download the Windows Media Encoder 9 Series. This nice little encoder application isn't only limited to post-processing (very nice indeed in this area), but can also do live-broadcasting as well as screen recording. Narrated screen recordings are sometimes simply more useful than written step-by-step instructions (even if "littered" with screenshots). 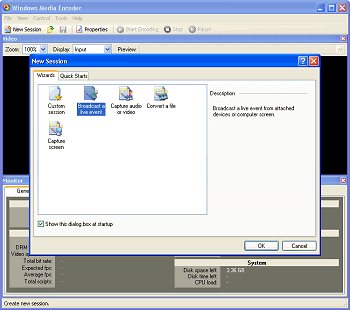 That's why I recorded a quick (non-scripted, you will be able to tell) how to set up Windows Media Encoder for screen recording. Nicely formatted commit mail. The change log line items are parsed, the A, U & D information is used to build Added, Modified & Deleted sections in the message. now supported. Added attribute value auto-completion. Installation Take all three files from \Hook and place them in your repository's hooks directory. Open post-commit.exe.config and modify the entries in the appSettings section to match your installation and needs. Test it Run post-commit.exe once interactively from the command line to see if your installation is ok. Potential errors are only logged to post-commit.log, not to the Console. So be sure to check it! I updated the post commit hook application, however, installation advice from the original blog entry Post Commit Hook for Subversion, the .NET way still applies. What's new? The revision info is parsed and more nicely presented in the commit mail message. Because of info parsing, one call to svnlook could be saved. In the entry Subversion on Windows as a Service, plus Commit Hook and Backup Script I showed a batch file for hooking into the post commit event of a repository. This batch file annoyed me from the very beginning. During the Indigo Community Day on Thursday in Munich I decided that it was about time to get rid of it, and after yesterday's party, I thought it might be a nice pinky exercise to do the basic port to C# today. Just as the batch file, post-commit.exe's task is to read the change log and commit message, and post it to a mailing list that distributes the information to the project stakeholders. Therefore, you need to configure the four Mail* settings to match your configuration and preferences. The SvnLookPath needs to point to your Subversion installation, however, most installations should be fine with this default. In the current version, testing is highly recommended as no logging or exception handling is implemented. The source code is BSD-licensed. Future plans are to fully parse the svnlook output, as well as add a logging infrastructure to easily find configuration problems during normal operations of your Subversion server.